Robert Doisneau’s unforgettable portrait of an enamored pair enjoying an unhurried embrace in the center of Paris is aptly named “Le Baiser de l’Hôtel de Ville,” and many a couple have been spotted playing copycat and posing in front of the same lamppost (with or without a bespectacled Parisian gentleman wearing a beret in the background!). 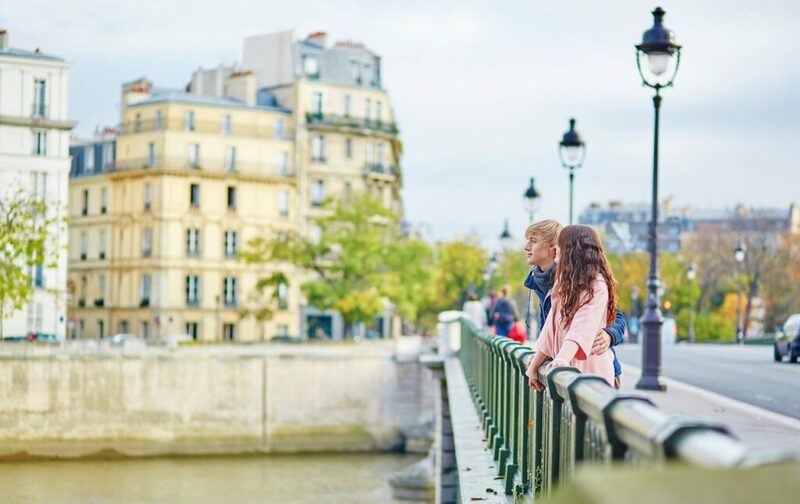 We’ve highlighted our Top Ten most iconic places to get the perfect romantic shot and immortalize a moment spent in The City of Love. Cameras at the ready! If you time it just right and stand half way across the bridge with your backs to the Eiffel Tower when it sparkles (on the hour every hour after dusk), this is the ideal spot to snap an unashamedly sentimental “selfie”! Built by Napoleon III in the 1850s, this is the bridge to go to if you want to take a peek at the “zouave” statue, which famously marks the water levels and reached an all-time high during the floods of 1910. The golden statue of the Liberty flame on the Right Bank also pays tribute to the tragic demise of the ultimate romantic, Princess Diana, in the tunnel just below, back in 1997. After paying your respects, carefully cross to the safe haven of the chic brasserie Chez Francis (open every day of the week until 11:30pm) and raise a toast with a cheering glass of champagne, perhaps while awaiting the renewed twinkling of the tower on the following hour: the terrace is a great vantage point. Cherubs, nymphs and winged horses, exuberant Art Nouveau lamps and a spectacular Beaux-Arts style—it’s hardly surprising that this is the place so many photographers choose to capture newly weds on film. 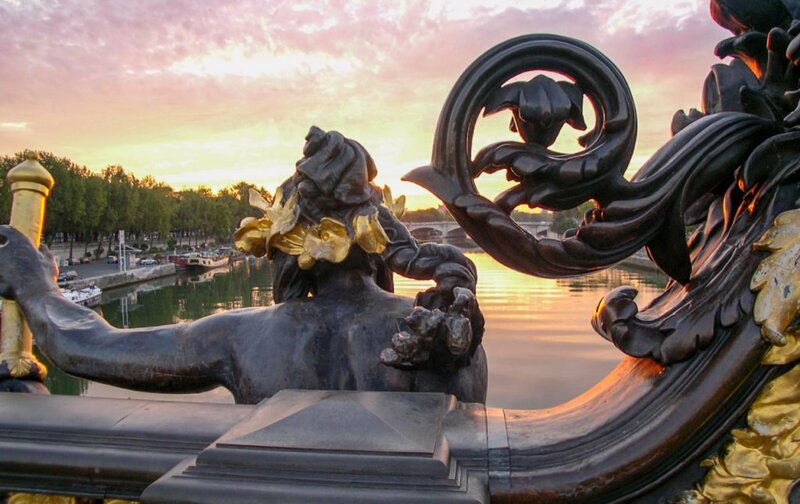 This is also where Owen Wilson finally got his girl in “Midnight in Paris,” and it’s the bridge Adèle chose to portray her heart-rending (and best-selling) “Someone Like You” arrangement. Take your photo here against the magnificent backdrop of the Invalides, or with the imposing glass-domed Grand Palais behind you – then add the perfect touch by enjoying a cocktail or a delicious dinner at the stunning Mini Palais restaurant with its high ceilings, contemporary Eric Frechon menus and fabulous all-year-round terrace. Look no further if you want to know where the best – and least known – views of the whole of Notre Dame are to be found. 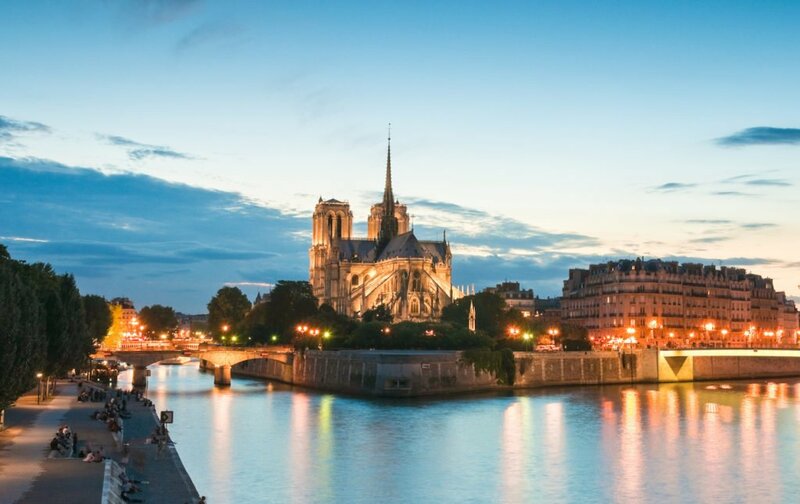 It’s worth persevering and walking the extra (half) mile to the end of the Île Saint-Louis and seeing the cathedral from its rear end, and you’ll be able to take some absolutely breathtaking photos of this masterpiece of Gothic architecture. After taking in the splendid panorama, cut back along the rue Saint-Louis en l’Île and share a self-indulgent sorbet from Berthillon at n° 29, or pop round the corner and treat yourselves to a freshly filled chou pastry or two at La Maison du Chou (5, rue Jean du Bellay) – guaranteed to melt in your mouth – and melt your heart. A heartbeat away from Notre Dame and the breathtakingly beautiful stained glass windows at Sainte-Chapelle, lies what is arguably the most scenic square in the whole of the city. Hidden away just off the Pont Neuf, refreshingly uncrowded and glorious at any time of the year, Place Dauphine is a marvelous place for a photo opportunity, no matter which angle you choose. Follow in the hallowed footsteps of famous French actor Yves Montand, who chose to live at n° 51 with his paramour Simone Signoret in the 1950s, and take a romantic pose overlooking the Seine just around the corner, then stroll over the Pont Neuf to the Odéon area for an apéritif at the chic literary café Les Éditeurs, for a taste of French cinematic glamor. If you’d like to create a base here in Place Dauphine during your stay in Paris, look no further than our building at n° 25! 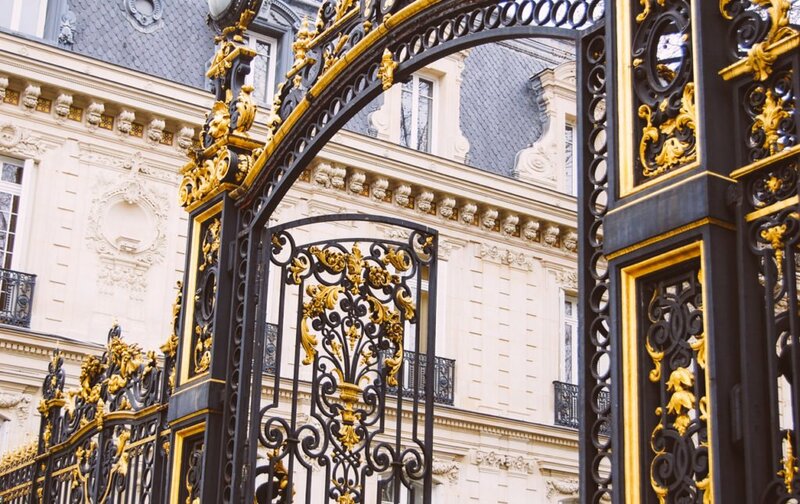 It’s tempting to be drawn to the better known gardens like the Champ-de-Mars and the Jardins de Luxembourg, especially if your time is limited, but if romance is in the air head over to the 8th arrondissement and discover the small but perfectly formed Parc Monceau, entranced by passing under a breathtaking gilded gate. This romantic-style park, complete with scaled-down lake and Roman style colonnade, even boasts a miniature bridge styled after the Rialto original in Venice: if that isn’t the ultimate photo spot, we don’t know what is! After filling up your camera, complete your promenade with a visit to the grandiose yet less-well-known Jacquemart-André Museum and learn the chequered love story of its former owners, then indulge in a slice of heaven in the hedonistic tapestry-bedecked tea room. 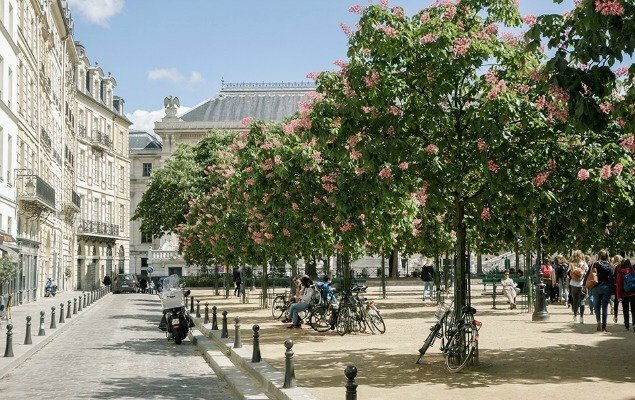 Wrap up warmly and take an expedition even further afield to this sprawling park – it requires a little bit of effort to get there from the very centre of Paris, but it’s definitely worth the detour. Built in 1860, the amorous claim to fame here is the aptly named Temple of Love, where many a wedding proposal has been accepted and where visitors from near and far come to take photographs as a testimonial of their vow renewals. 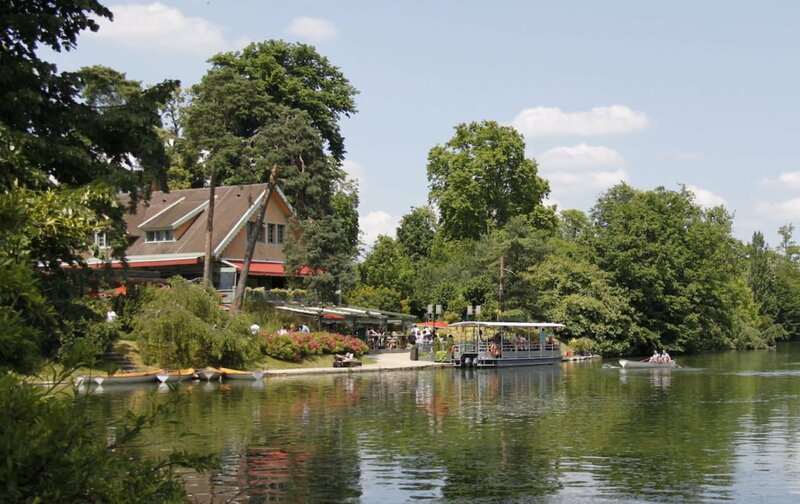 For the more adventurous, travel there by metro line 8, then walk up to the Lac Daumesnil. For the best photo shot, stand opposite the Île de Reuilly island. Picture obtained, you can always hire a boat and row across to the island – and don’t forget to walk down and visit the grotto below the temple. 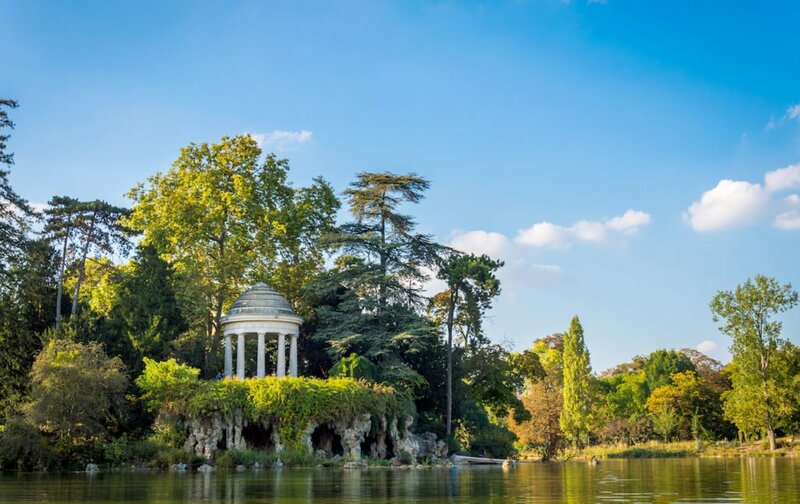 It’s hard to believe you are just a ten minute drive from the Arc de Triomphe when you hop on the ferry boat at the Bois de Boulogne and embark at this ultra-romantic haven of tranquility. Bequeathed by Napoleon III’s wife, Empress Eugénie, the chalet is now a fabulous spot for lunch, dinner or Sunday brunch. Possibly the most idyllic part of the city! Click here for their website. It matters not whether you are being wined and dined here, or are enjoying a romantic escapade over lunch, it is impossible not to be swept away by the historic surroundings and the sheer perfection on your plate. 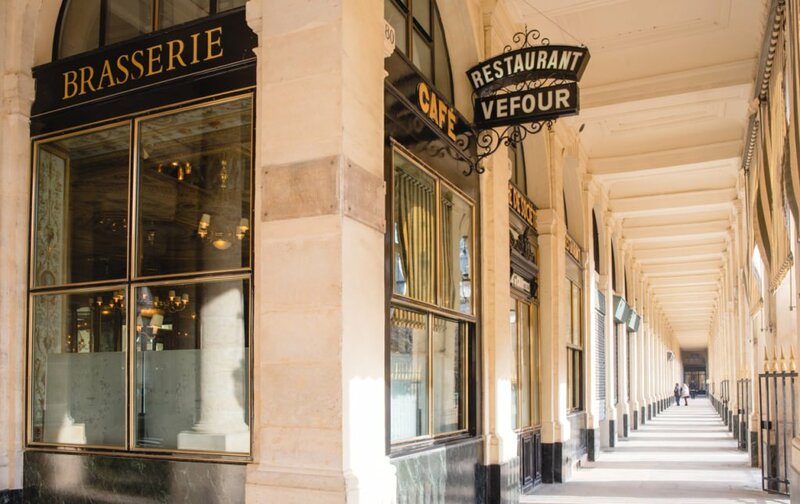 This restaurant has been in situ in the Palais Royal gardens for over 200 years, and sweeping aside the red curtain to step inside for the first time is an unforgettable sensation and something everyone should experience at least once in their lifetime. In “The Importance of Being Earnest”, Oscar Wilde winningly coined yet another phrase by stating that “The very essence of romance is uncertainty”. There’s nothing even remotely uncertain about this secret hideaway “adresse de rêve” close to Odéon, where the writer spent his final evenings back at the turn of the century. Walk through and admire the circular staircase en route for the restaurant, and check out the tiny courtyard complete with fountain, before settling to luxuriate in the Michelin starred cuisine on the menu. Five star service guaranteed! Browse their website here to get a peek into the suptuous style of this unique place! 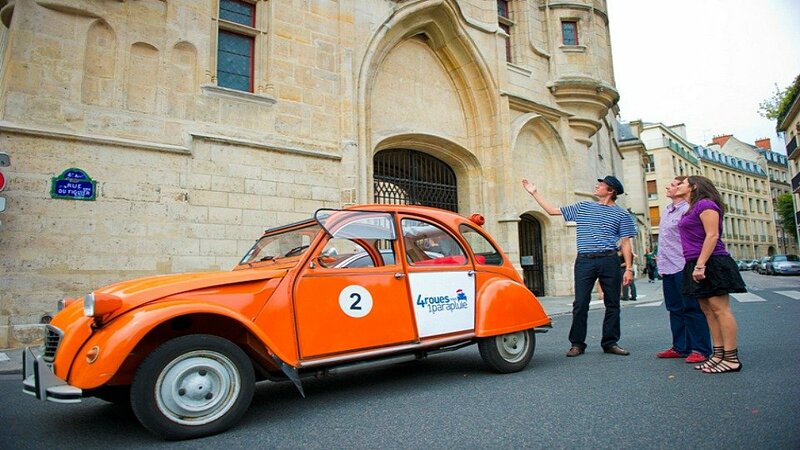 If you feel as though you won’t recognize the ideal spot for your picture perfect location until you see it, enlist the help of an open-top tour in a vintage French car! Snuggle up in the back of the Citroën and let your charming chauffeur drive you round the capital, show you the hidden sights and suggest places to pause and snap the camera. More info here. PREVIOUS: How to Have an Unforgettable Valentine’s Day in Paris! Posted on Wednesday, January 25th, 2017 at 9:41 pm in See & Do. You can follow any responses to this entry through the RSS 2.0 feed. You can leave a response, or trackback from your own site. 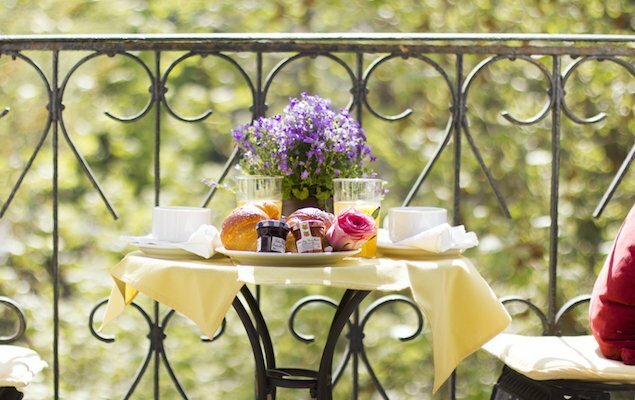 The 6 Most Romantic Paris Apartments for Lovebirds! 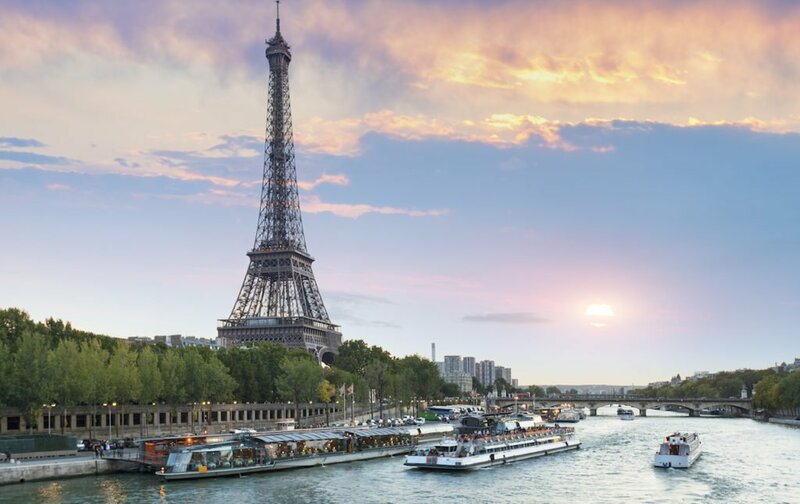 A Romantic Christmas Escape to Paris Romantic Valentine’s Day Tours in Paris Book Now for an Exceptional Valentine’s Day in Paris – With 25% Discounts & Romantic Extras!